What I got from BlissDom Canada. Besides the swag. I went into BlissDom Canada this year with an open mind. I knew I wanted to spend more time networking and getting to know my fellow bloggers. Last year, I was a little more timid and spent some time awkwardly loitering in the corner. Not this year. This year I couldn’t claim newbie. This year I had to be brave. Turns out that was the perfect stance to have, as the conference opening address from organizers Shannon and Jennifer expressed their desire to see us all be brave in 2013. 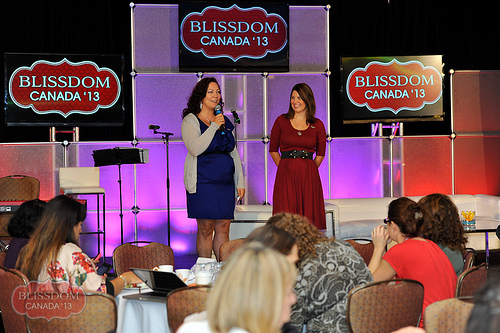 The Bliss Chicks, welcoming us all to BlissDom Canada 2013!! With 2 1/2 days filled literally to the brim with social activities and learning sessions, it’s hard to look at summarizing it all in just one post. I’ll do the best I can. The weekend started out with a fantastic newcomers meet up, sponsored by Savvy Mom Canada (LOVE THEM!). It was a very relaxed event that allowed everybody the chance to mingle, reconnect and approach the people that looked about as scared as I did last year, and make them feel welcome. One of the first things I noticed that this event was a specific table of food with a helpful little sign on it. 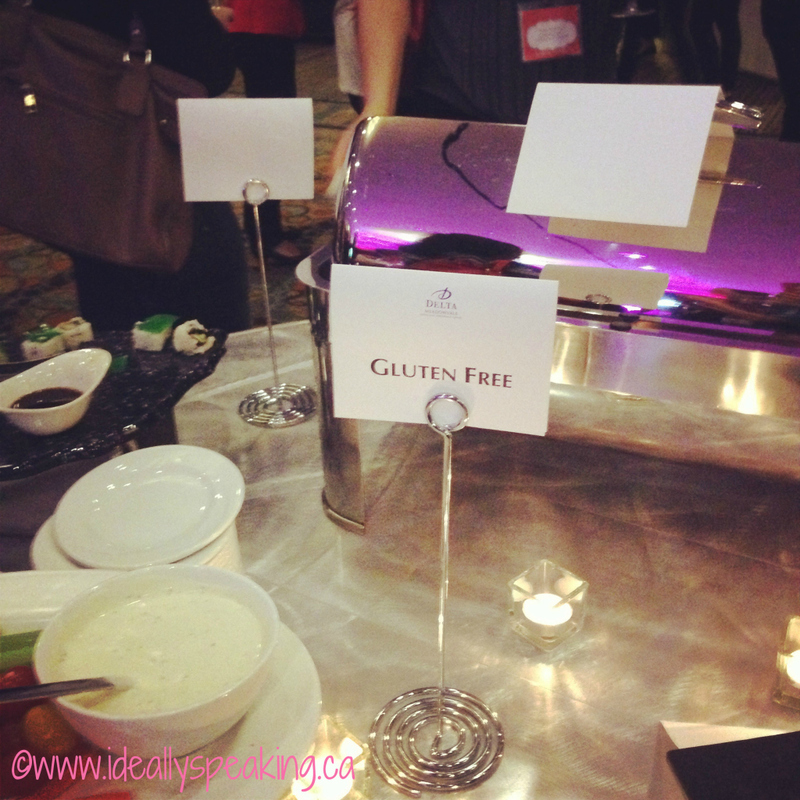 I want to say a big thank you to the BlissDom organizers, who really paid close attention when offering a wide range of food over the course of the weekend. It made all of us gluten-free attendees very happy. The newcomers meet up was followed immediately by a general welcome reception, which was sponsored by Splash Media Engagement and 19 Crimes. 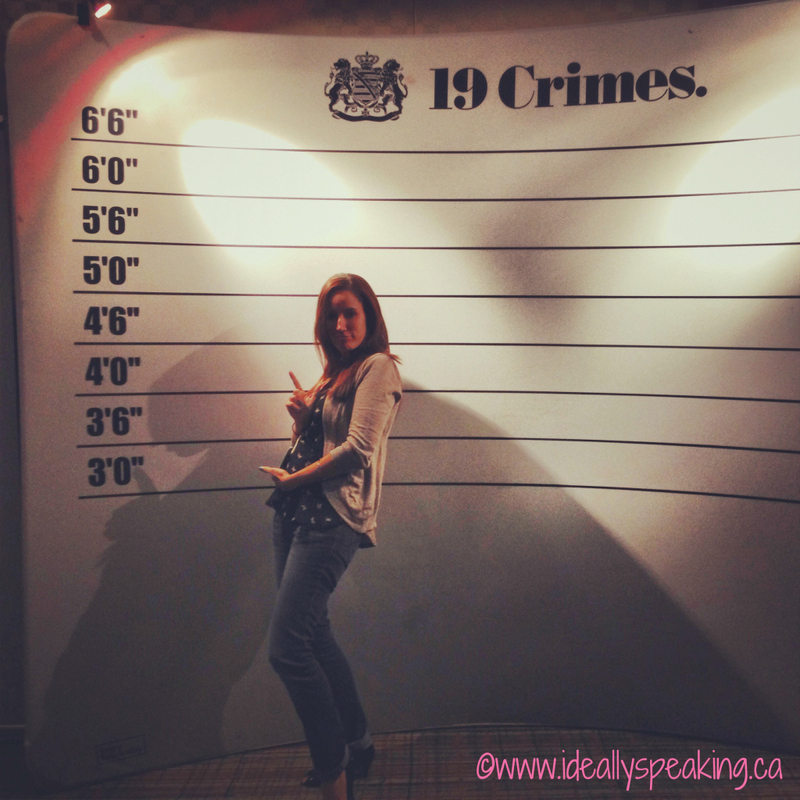 In honour of their brand and media message, 19 Crimes had a fun photo opp set up at the event. So the baby and I got our mug shot taken. We’re badass like that. 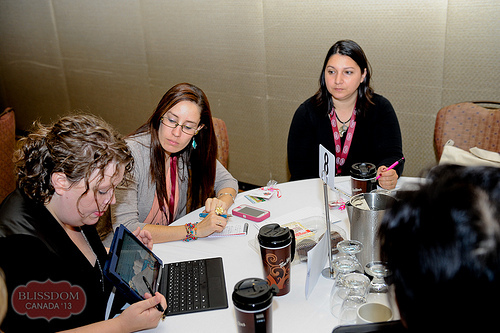 Breakout Sessions – This year, Bliss focused on three different tracks for learning and development; Work, Create and Change. Being a blogger who refuses to choose a niche, I naturally had trouble selecting a track…so I attended a little of each. In this session, I learned a lot of great tips on where I can go with my blog. Each speaker did a wonderful job demonstrating how they had gotten to where they are today. They highlighted different techniques, such as making sure that you reach out to network and make proper connections with people. Don’t just ask what they can do for you, but ask what you can do for them. The art of creativity was an excellent talk. It examined the different personality types, and how they relate to creativity. It was very interesting to sit through and go through the different characteristics and try to figure out which one I am. Going through the creative types, I found myself floating somewhere between a dreamer and a daredevil. To learn more about the creative types, I highly recommend you check out CreateMoreMakeDifferent.com and take the creative types test offered up by Jason there. This session was one of the ones I was looking forward to the most. In my day job, I’m professional content writer for the corporate sector. I was very interested to learn how I can adapt some of my content methods for my blog. One of my goals this year is to really start taking my writing more seriously. I need to get in touch with my inner writer soul. That little girl who dreamed of writing from a very young age and still dreams of getting published. This blog was started as a way for me to continue to grow and hone in my writing skills. I don’t necessarily feel like I’ve done that to the potential that I know I can. This session was really great for inspiring me to get back to the core of my writing. Writing for me. Writing openly. I love posting fun stories about my family or sharing my outfits of the day, but at the end of it all, I really miss writing good quality pieces. Pieces that speak my opinion and flex my wings as a writer. Kirstine Stewart gave an amazing talk on the history of Twitter and where she sees it heading here in Canada. I know I speak for many at the conference when I say that a good deal of her quotes from the talk resonated with us. She reminded us how Twitter is “made up of moments” and that we can “do a lot with 140 characters.” She pointed out that the quality of the content in a tweet is so important, which I know can be easily forgotten. For me personally, this was by far the most inspiring and emotional part of the whole conference. I take extreme care to never bully, tease or belittle someone online or in real life. As an child abuse & sexual abuse survivor myself, any talk on bullying is one that hits close to home. I can’t get into how this session touched me emotionally because honestly, it deserves an entire separate post, which it will receive. Instead, I would like to share some of the learning we got from the incredible speakers on the panel. 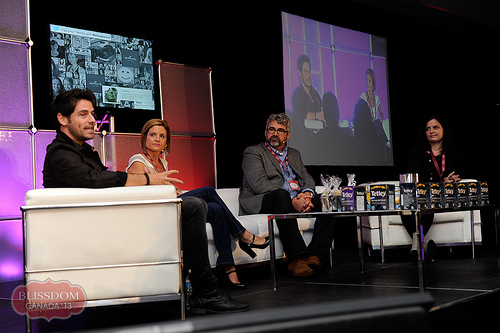 This panel was all about understanding why it is so vitally important to be kind to each other online. We lead by example for our children to see. We can either promote kindness or hatred. The choice is completely ours. I think the best way to share some of the lessons that were shared is to repeat a few key quotes from the speakers. After the panel was over, I approached Glen Canning. As I am sure was the case for anyone in the room, I had followed the case of his daughter, Rehtaeh Parsons, very closely. I spoke to him briefly, oped up about my own past surviving sexual assault and how I hit a point of wanting to take my own life. I talked to him about the lifestyle it led me to and the darkness I had to climb out of. I thanked him for the incredible work he does in his daughter’s honour. Then I hugged him, because how could I not. I could go on about this encounter and what it meant to me, but as mentioned above, this will get it’s own dedicated post soon. Heading into the evening portion of Saturday, we all geared up for some glamtastic fun. The theme of the Great Canadian Outdoor Party was Glamping. I had thought about busting out a gown…but my current pregnant state left me craving more comfort I opted for plaid, heels and tons of bling, for a great glamour camping look. Jacqueline & I showing our perfect ‘glamping’ style in plaid & heels. I stayed out WAY past my bedtime on Saturday night after the glamping party…and it was totally worth it. Microsessions – Last year I co-presented at a microsession. While that was a great experience in it’s own right, I was pretty excited to actually attend sessions this year. This session quite simply blew my mind. Wow. There was just so much I did not know. I highly, highly recommend that everybody get in touch with Shoebox-Be-Gone and learn exactly what you should be doing in terms of monetizing and running your blog like a proper business, if that’s something that you want to do. Angele really brought into focus what I should be keeping track of and how to get better organized as a small business. Angele, sharing her vast wisdom on how to navigate tax time for your blog or business. Who doesn’t love Canadian Dad? I knew that this micro session would be a fantastic learning experience. Although my day job is dealing with growing social media communities for the corporate sector, doing it on a personal level takes much different tactics. Chris has managed to build an outstandingly engaged and responsive community in his short time in the blogging world. It’s truly been awe inspiring to watch. He talked about how true community engagement and organic growth on social media can come from sharing and talking with one another, versus just self-promotion. This was another one of those workshops that I was really looking forward to. Being a marketing executive for many years, I have been on the receiving end of media kits many times. For whatever reason I’ve been hesitant to put together my own. 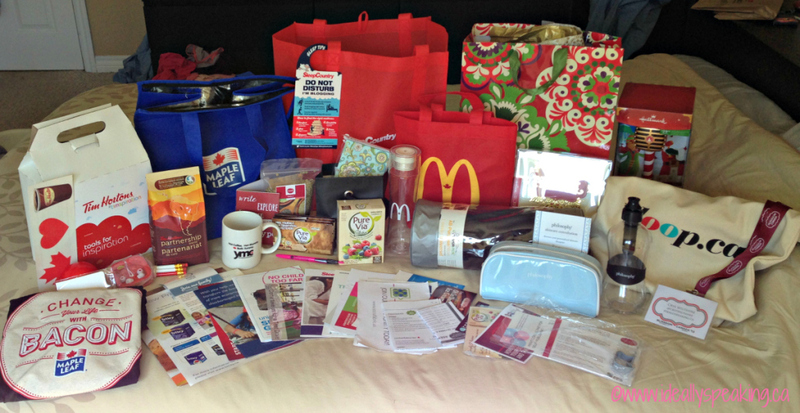 Being one half of 5MinutsForMom, I knew that Janice had a lot of experience working with a vast number of brands. She presented us with examples of not only her media kit, but also the media kits at some other well-known bloggers. Showing the different ways that we can set it up and highlight what we can offer companies. The power hour was kind of like speed dating…but for bloggers. Each of these incredibly talented and inspiring speakers had exactly 7 minutes each to get up and share their wisdom. Again, I think I can best share the insights I got from this power hour through a few select quotes. I don’t have a quote from Shannon, because she shared something a little different. In her truthful and hilarious way, she told us about the time her mom left her on the side of the road with a bleeding pig. What I got out of it was that honest story telling and delivery matter, even when you are sharing a memory. It had everyone laughing to tears and is completely worth your time. Go read it now. Hands On Workshop – Sunday afternoon was spent in a final workshop that was more interactive. I choose the change track for this session because I know one focus I have is to be more vocal with my ability to make change. I was hoping to get some motivation to really take a firm direction in what I want to be known for. Jen and Tania delivered that motivation and then some. I’m not going to get into this too much, only because I already have a lengthy draft post on what I fully got out of this session I do want to leave you with the direction they gave us – Choose your tagline for life. What do you stand for? Are you living that stance right now? If not, how do you get there? I don’t quite think there is a way to summarize just how amazing the talk from Drew Dudley was. There could not have been a better speaker to close off the conference. We all got a heavy dose of food for thought to walk away with, accompanied with some laughter and tears. Again, I think the best way to share his knowledge is to share a few of his words. For that last one, you are likely going to have to go watch a few of Drew’s clips to have it makes sense. They are completely worth your time. He has a bunch of links to video clips on his Facebook page. 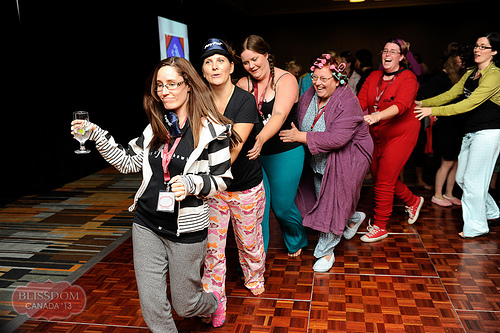 The final night ended off the conference with an incredible pj party and pampering, generously sponsored by Cottonelle, Micosoft Canada and PayPal. My amazing take away from this portion of the conference was more energy than I had felt in over 3 months. Heading over to the pampering area, I got my first massage in a long time. Let me tell you, this pregnant mama really needed that. Once again, I stayed out way past my bedtime, talking into the wee hours with great new friends. And if all of this doesn’t sway you; the learning, the growing, the developing. Then, ideally speaking, there is always the swag. There are a few pieces of swag not shown in this photo that are worth mentioning. Such as the delicious food provided by McDonalds and Canadian Lentils. Free coffee, tea, donuts and treats all weekend from Tim Hortons. A beautiful free card mailed out to my little lady from Hallmark. Plus tons of valuable resources from evenflo baby, Fresh Books, Rent Frock Repeat, Unicef Canada and Collective Bias. I’m Co-Presenting at BlissDom Canada! 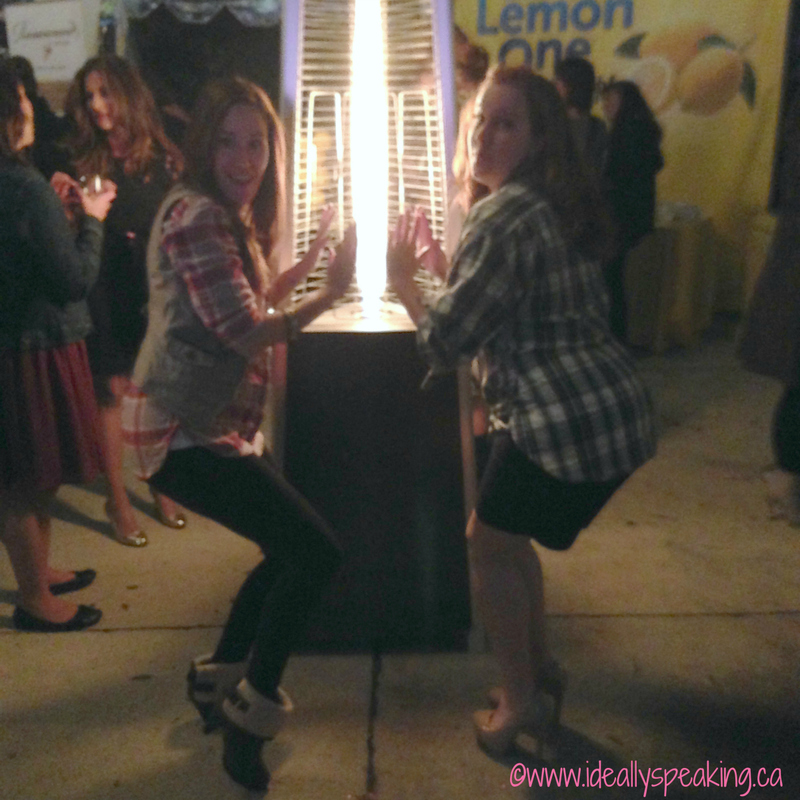 #WordlessWednesday with linky: BlissDom Canada! Spring Fashion with Sears Canada! #SearsMom Wordless Wednesday with linky: Canada Day 2013! Great post! What a wonderful re-cap of an amazing weekend! Woah! This recap packs a punch! Amazing. I’m in awe.